We have all been in the position where we are faced with a carpet stain that we feel is impossible to remove. Suddenly we are having to consider the cost of replacement and the possible disruption that it would cause, yet alone the unexpected cost. 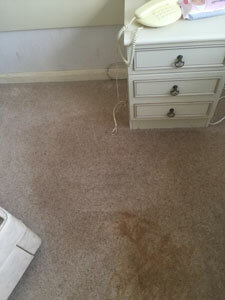 Although we all do what we can to avoid carpet stains; sometimes they are unavoidable. This is where we feel that our skilful services provide great value for our customers. 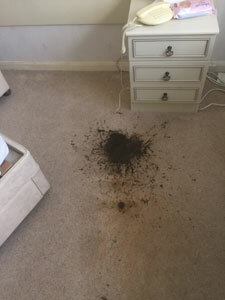 We were asked to remove this particularly awful stain in Gerrards Cross. When visiting the property, the initial consideration was the fact that it would be a challenge to deep clean the carpet. It is a good thing that we are not afraid of a challenge and take great pride in the process of removing stains. The image showing the stain prior to cleaning commencing shows just how dark the pigment was. It is often the case that if you are inexperienced that carpet fibres can be damaged through the process of rubbing or scrubbing in the aim of cleaning deep into the fibres. Even if the stain is removed; you are likely to be left with an unsightly, matted area on your carpet where the stain once was. If you would like to enquire about our carpet cleaning service call today on 0300 088 2188.